As our Nissan Cefiro passes eleven years old, Tawn and I keep thinking about a replacement car. In his mind, the perfect car would be something unique and stylish, maybe a classic instead of a new model. A few Sundays back, he announced that he wanted to visit a used car dealer on Vibhawadi Road near the old Don Meuang Airport as he had spotted a cute car there and wanted to know what it was. Turns out, it was a Nissan Figaro. 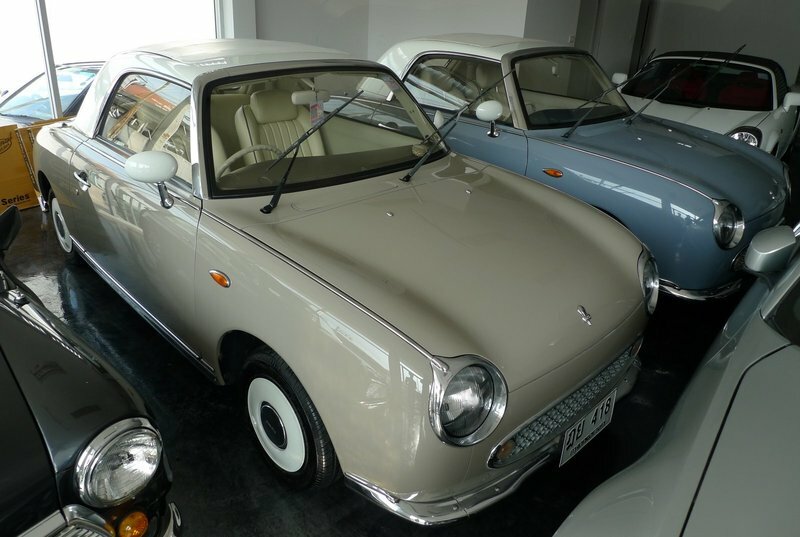 The Figaro was a limited-edition retro car released by Nissan in 1989 only in Japan. Some 20,000 were made. 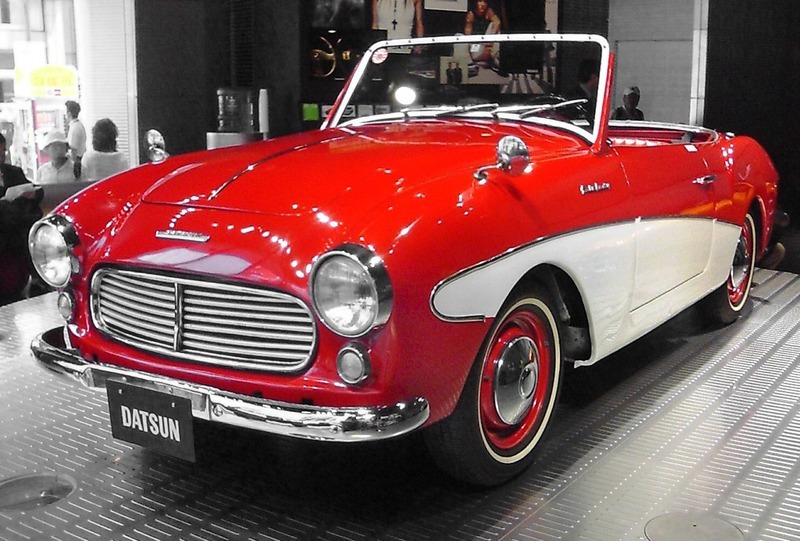 It was built by Nissan’s special projects group known as the Pike Factory. The car is a popular one for collectors, especially in the UK. The used car dealer had a half-dozen units in stock. They specialize in importing classic cars and refurbishing them for resale. They choose only low mileage (about 55,000 km on average, about 35,000 miles) cars that have never been in accidents. The cars are then completely gutted and rebuilt. 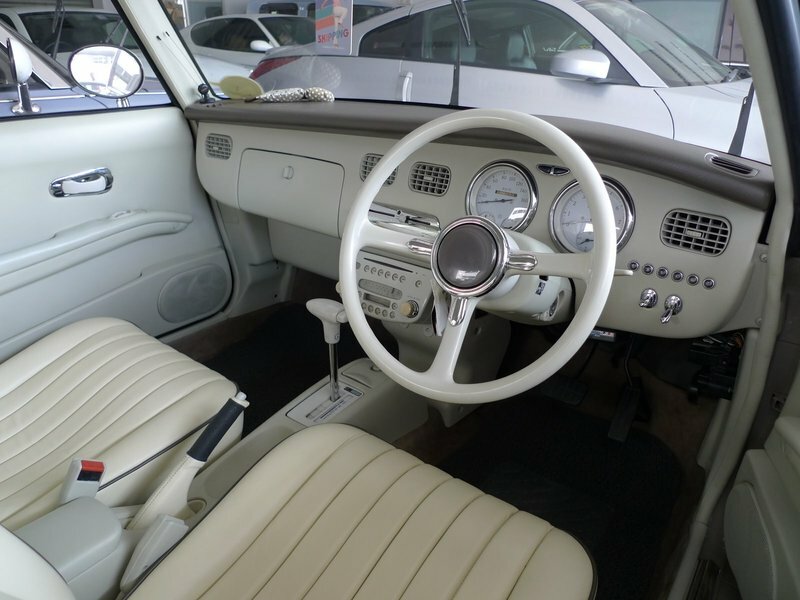 Engines, air conditioning, and all other systems are thoroughly overhauled and the interior is reupholstered. They are very thorough and invited us to walk through their garage so we could see the work in progress. The result is spectacular, lovingly restored. Before I went back and did some research, I didn’t understand that the car was actually 21 years old and thought it was a more recent model intentionally made extremely retro. 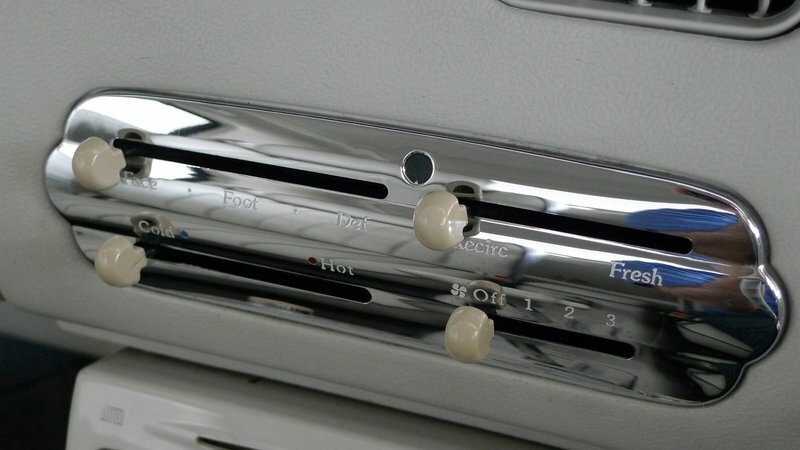 Ventilation system (including air conditioning) is appropriately retro and refreshingly manual. Nice to have actual levers rather than buttons. 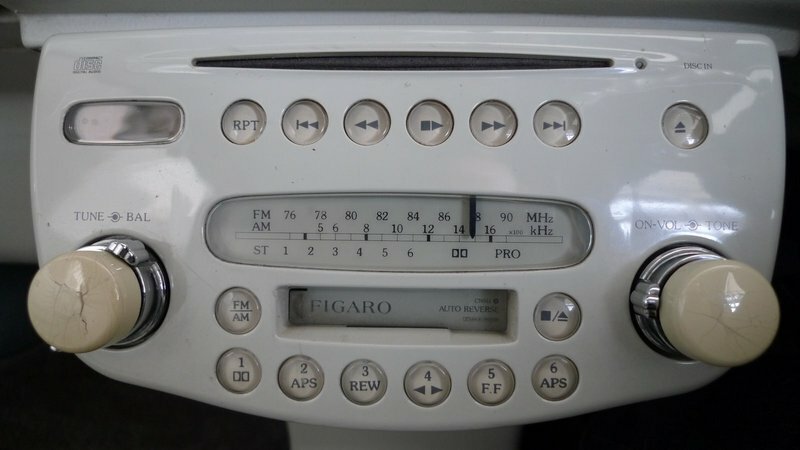 The stereo system (notice the cracked laminate on the dials) features a CD player, something that was quite cutting edge in 1989. And a cassette player for you cats who aren’t up to date with the latest technology! Sorry, no MP3 input. The Figaro was also an open roof style convertible. Completely and utterly impractical in Thailand but really cute and the best way for me to sit up straight in the driver’s seat. The car was originally offered in just four colors – Topaz Mist, Emerald Green, Pale Aqua, and Lapis Grey – but the restorers offer a few additional colors including the pink you see here. My assessment of the car? Well, totally and utterly impractical but very, very cute. If we wanted a second car to drive for weekend getaways at the beach, this would be it. Unfortunately, there wouldn’t be any room for a suitcase or overnight bag, but we could drive to the beach and then drive back the next day wearing the same clothes. So how much for this beauty of a rebuild? 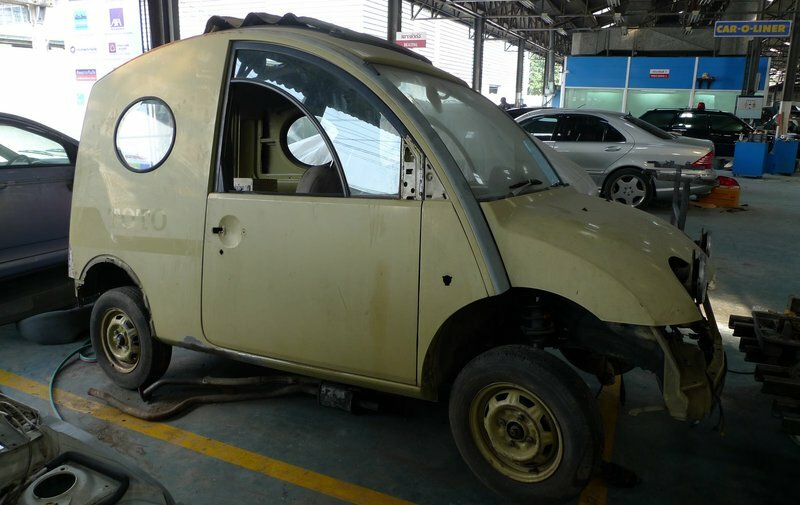 900,000 baht (US$30,000) for a 21-year old car. Now, cars in Thailand are more expensive than in the US, but to give you a bit of a comparison, I could buy a top of the line Nissan March, a contemporary (and larger) version of this car, for less than 570,000 baht. And I think the March is a cute car, too. So I guess we’ll put this on the “Sunday afternoon daydream” list! The dealer is also restoring a Nissan S-Cargo, another 1989 release from Nissan’s Pike Factory. Inspired by the French Citroën 2CV camionette (small truck), the name was a double entendre meaning both “small cargo” and “escargot”. Clever, huh? 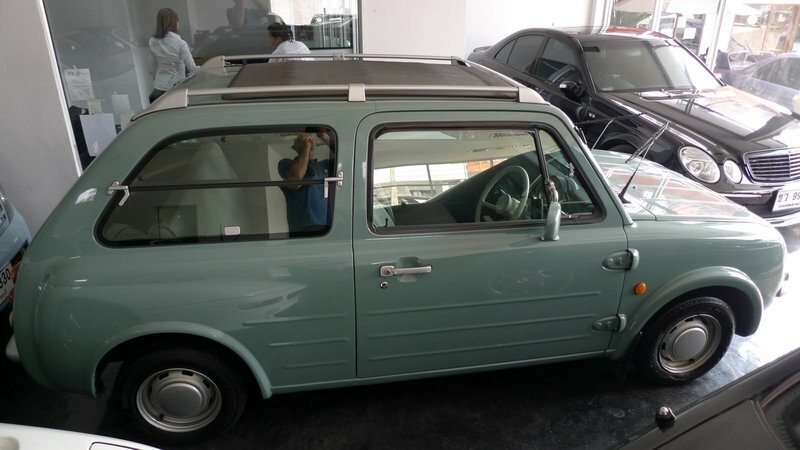 The dealer also has one more product from the Pike Factory: the Nissan Pao. Released at the same time as the Figaro and S-Cargo, the Pao was also retro-inspired and had amazing fuel economy: 51 mpg (5.5 L/100 km) in the city and 79 mpg (3.4 L/100 km). Prius-like mileage almost two decades before the Prius. This entry was posted in Uncategorized and tagged auto, automobile, car, Figaro, Nissan, Retro, Vehicle by christao408. Bookmark the permalink. How much is the Pao??? 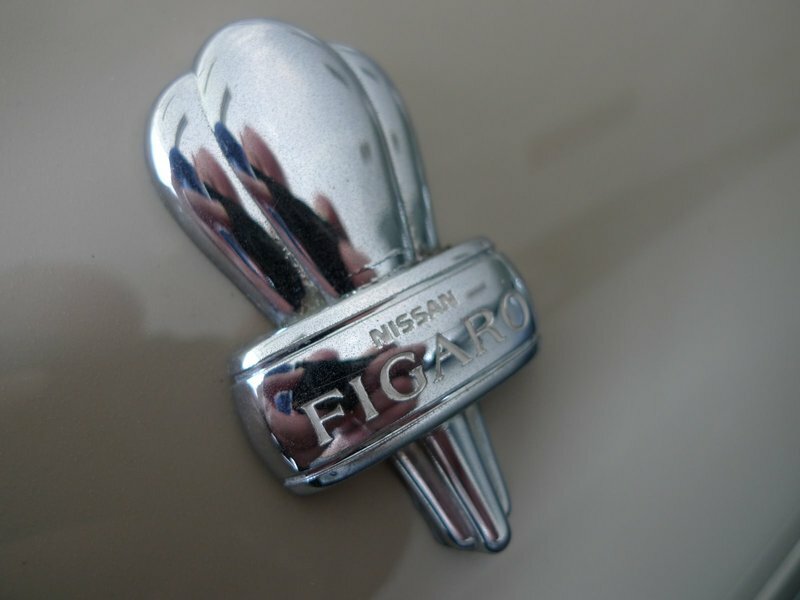 I sensed a car post coming up with the photos you’ve posted.I used to have a a Nissan Fairlady! More modern though. I am a lover of the old cars. I came very close to buying a 57 T-Bird. As you mentioned, not practical at all. I was in my twenties at the time and my car was essential to get me back and forth from college and job so anything that old would have been silly. But it was baby blue and so cute! @christao408 – Didn’t know we were voting here. I vote for a Mini Cooper S or a Clubman S! WOW. That is amazing. I love the way they refurbish the entire car. I remember passing by old car dealers in BKK and seeing a bunch of older Mercedes (1970/1980 models) and suppressing the impulse to stop there and buy. As for a new car, I still vote for the Audi A3 or Mercedes B Class. Both are spacious, good looking (well, de gustibus non dispudandum est), and of good quality. Hehe! We just bought a Honda Fit (bright red) and it has decent headroom. 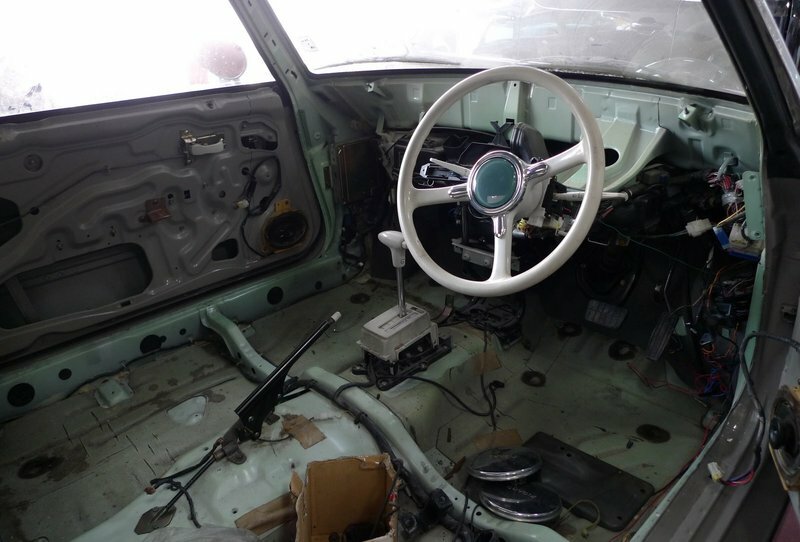 No matter what you get, it should be comfortable for you to drive and ride in and it needs to be reliable – old and refurbished does not guarantee relaiability. Go with a new one!! The cars are definitely cute! Almost makes me want one too. @christao408 – Well then I guess I’ll collect signatures for a recall! @TheCheshireGrins – Wouldn’t it be nice to have (be able to afford!) a weekend car? @iskrak – They do look like little toys, don’t they? They are nicely restored. The features that I think the older cars may not have are safety equipment (e.g. air bags, electronic stabilization control and better frames) and better emission controls. @ElusiveWords – All true points. I think the most advanced safety feature in this car is three-point seatbelts in both the front and rear. 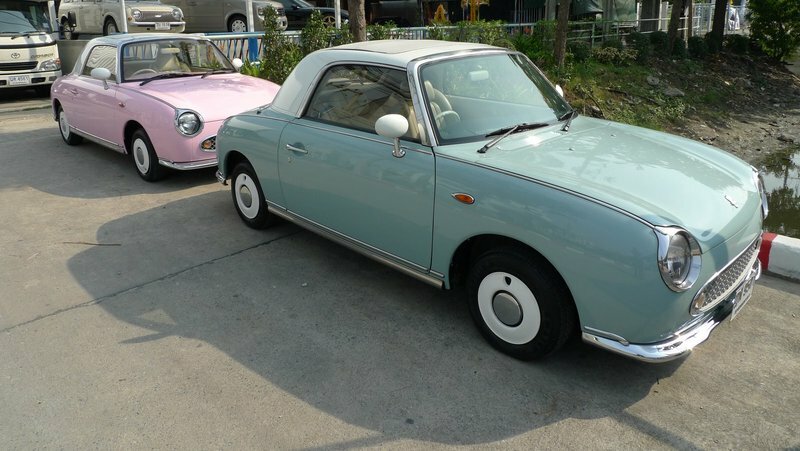 ok, now i WANT a nissan figaro. darn it. can’t afford one. fyi, my car is nissan x-trail. not sure if the name will be called differently in overseas market. @rudyhou – Searching the X-Trail on the internet, it seems that it is distributed in neither the US nor Thailand. Never seen one before. check out this site http://www.nissan.co.id/id/web/homepage/index.htm. mine is a 2005 production so it’s not as nice as what you’ll see on this site in terms of the exterior and interior design but you’ll get the idea. @leslie – Leslie, I’m afraid I don’t know the dealer’s name but it is on the east side of Vibhawadi Road to the south of the old Don Meuang Airport. Would recommend you just drive up to the airport and then head back on Vibhawadi Road, staying to the left-hand side. When we were last up there, they had several of the cars sitting out, visible from the road. It’s been a year since that model has been released and indeed it was a big success for nissan. It’s features are still viable on previous years.